Determined to get a head start after a pathetic crop this year (thanks to the erratic weather), I've just taken a secateurs to my babies - now they are all cut back and ready for overwintering. Fingers crossed for a good survival rate! 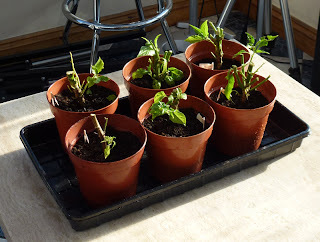 Hopefully I'll get a good crop of chillies earlier in the season next year, rather than waiting for a whole plant to grow from seed.....that's assuming the plants survive the winter! I've kept 1 x Orange Habanero, 1 x Jamaican Red Hot, 1 x Fatalli, 1 x Cili Goronong and 1 x Criolla Sella. I'm also keeping the 7 Pot White that didn't grow white.